I was born in New York City, immersed in art and architecture. I attended Pennsylvania Academy of the Fine Arts and then Boston University where I studied Urban Planning and Architecture. After practicing urban planning, I returned to painting, inspired by my son’s Crayola watercolor paint box. 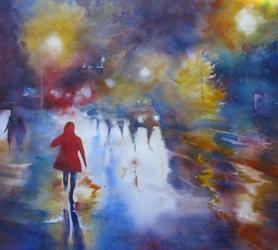 I became intrigued with the medium and have been painting watercolors ever since, the city innately my subject. I am affiliated with a number of leading art societies such as New England Watercolor Society, Copley Society to name a few and have juried and curated exhibits, taught watercolor and receive frequent awards for my work. Wendy will explore the beauty and mystery of the city at night.